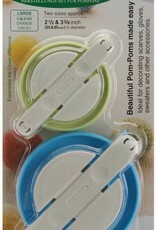 Pom Pom Maker Lg 3126 - Woolly&Co. Two sizes approx. 2 1/2-inch & 3 3/8-inch. Ideal for embellishments and perfect for scarves, bags, sweaters and more.